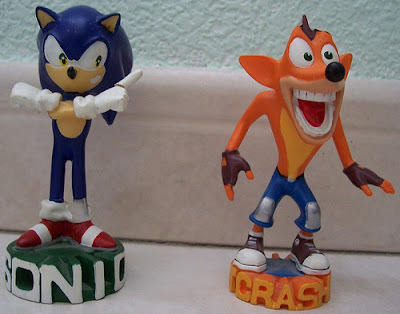 a capital wasteland: Sonic and Crash Bandicoot are the same series. Both characters were created to compete with Mario in the platformer market, and to compete with Nintendo's consoles. Both were originally first-party games on their consoles, Sonic for Sega's Genesis and Crash for Sony's PlayStation. Both characters are anthropomorphized, bipedal versions of small, obscure mammals. How many of you had heard of hedgehogs or bandicoots as a child before these games came out? Both series have the name of the animal in the title, in case you couldn't tell from just looking at them that duh, Sonic is a hedgehog, and of course, Crash is clearly a bandicoot. Both characters have first names that are edgy-sounding English words to kids in the '90s. Maybe the next series should be about Boom Wallaby or Pow the Wombat. Both anthropomorphized animals wear sneakers because they run fast, unlike that chubster Mario. Both series feature a human main villain who's a mad scientist: Doctor Eggman in Sonic, and Doctor Neo Cortex in Crash. Both series featured tons of mediocre spin-off titles no one cares about. Both series eventually fell from grace and ended up releasing on platforms made by competing console manufacturers. Today they're both relics of the '90s. How does it make you feel on the inside?